Mi-Grid is an energy management system that combines and optimizes multiple power sources: Solar PV, Wind, batteries, generators and utility power. With electricity becoming more expensive and less reliable, the need for reliable energy resources continues to grow for both businesses and consumers. Reduce your electric bills by utilizing energy harnessed from a variety of renewable resources with a multifaceted energy management system. MI-GRID is a hybrid energy management system that combines and optimizes multiple energy sources to prevent power outages, save energy, and reduce the cost of electricity. Whether you need power for an off-road trip in the family RV, or for your food truck, our energy system ensures that you are never without power, no matter where you are. Mi-Grid makes renewable energy reliable. Mi-Grid is a hybrid energy system combing and storing energy from multiple sources. Solar, wind, utility and local generator, any energy source can be used. It can be used with out without utility power, even from unreliable power sources. The energy storage system smooths transition from one source to the next. Mi-Grid allows renewable energy to offer true energy independence. Built with durability in mind, our energy management system features NEMA-4 enclosures and is designed for either both indoor and outdoor applications. Each system tested before leaving our factory. Whether you need short term backup power, long term energy assurance or off-grid power, Mi-Grid can supply your needs. Mi-Grid has pre-design solutions for Homes (on and off-grid), Mobile (RV's, Food Trucks, Mobile businesses and contractors), Commercial systems for business of all types, on-shore and off-shore oil, and large and small micro-grids. Call us to discuss your application today. If you are a business owner, you know the importance of making sound investments. Keep things running smoothly, no matter your situation. 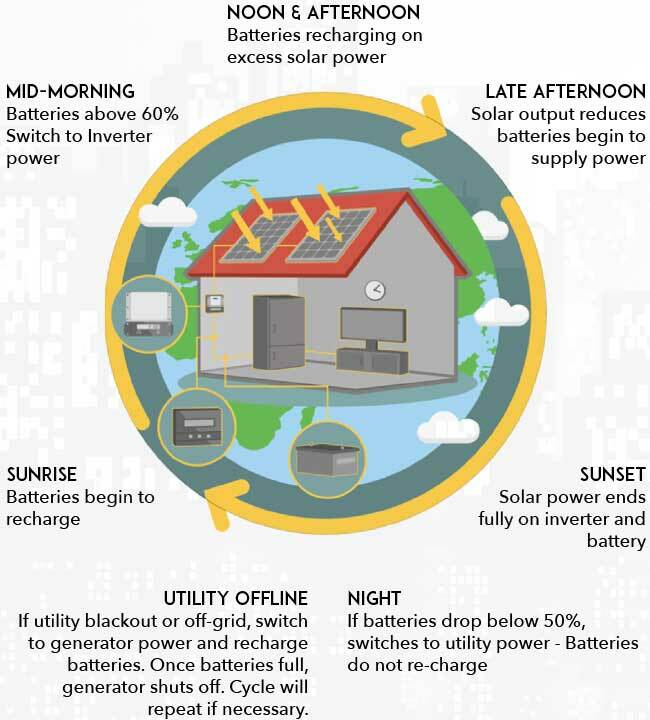 On-grid, solar provides savings, Mi-Grid keeps you on-line if the utility is down. It activates immediately, unlike a generator alone. Systems can be for essential power or full power. We can design a system to meet your needs for your budget. For off-grid power, Mi-grid reduces generator fuel consumption and operation by 90%, but costs half of a standalone system. At times of high power usage, or low solar production, the generator supplements . Any place you might consider an off-grid generator, Mi-Grid will save you money. Some applications pay back in as little as 18 months, even without solar subsidies. Turn to us for a hybrid energy system that powers your life. Available for small RV’s to large homes and commercial buildings, our hybrid energy systems power your life with consistent performance and exceptional storage capacity. Contact our specialists to save energy and reduce your electrical costs with a hybrid energy management system. We proudly serve customers worldwide. Mi-Grid can be Installed Anywhere! Larger system installations customized to the specifications of the application. "Quick quality install. Love the backup features while saving money." 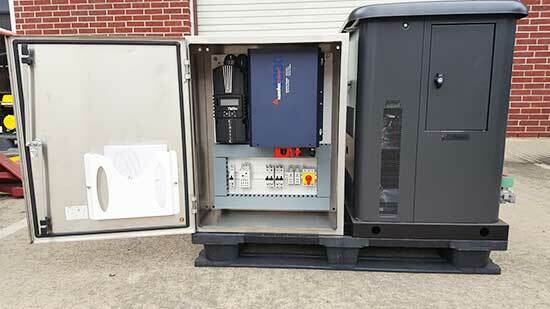 "We needed a system to provide backup power for our surgical unit. Great system and so easy to install." "I'm down the end of a long old electric line. Backup power with my solar only made sense. I love how the solar works." "I'm down the end of a long old electric line. Backup power with my solar only made sense. I love how the solar works." – Bill W.
"Great little off-grid system to power all of my needs." Get in touch with our Engineers for an Estimate! © 2019 MI-GRID. All Rights Reserved.